Ike Davis must prove himself. The Milwaukee Brewers reached a minor league agreement with Mark Reynolds this morning. Milwaukee has been searching for a first baseman all winter long, and it appears they’re looking towards Reynolds as their solution. 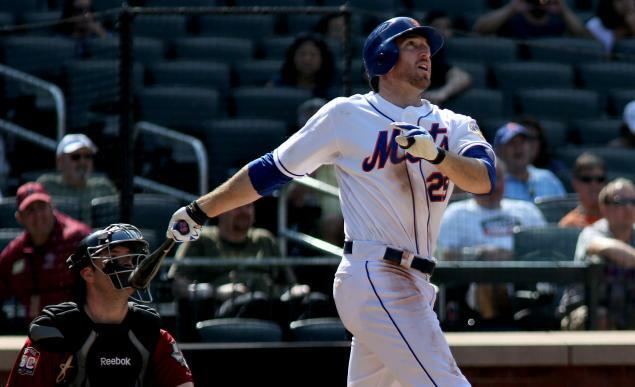 The Brewers have flirted with the Mets this offseason regarding a trade for Ike Davis. The Mets wanted RHP Tyler Thornburg, a top pitching prospect whom the Brewers have penciled into their fifth starting slot going into Spring Training. Milwaukee deemed that price too high. In signing Reynolds to a minor league deal reportedly worth $2 million, they revealed that pretty much any price would be too high. It’s interesting this came a day after the Mets avoided arbitration with Davis by signing him to a one-year, $3.5 million contract. While those numbers were largely predictable, since Ike made $3.1 million last year, and the arbitration process typically leads to some kind of raise, perhaps the Crew were scared off by Ike’s new salary. Or some combination of his salary and the Mets’ ask of Thornburg. But it’s clear that the Brewers have decided to fill their first base need on the cheap. Reynolds – not unlike Davis – has great raw power, but a penchant for spells of sheer incompetence at the plate. He has 202 homers in his seven-year career, and has hit more than 30 three times (including 44 in 2009). He’s also struck out over 200 times in three separate seasons, and has led the league in that category four times. Essentially, the Brewers have gotten an Ike Davis analogue (but with more of a track record), and they didn’t have to surrender Thornburg – or anyone else. So, that leaves the Mets with Davis. Milwaukee was probably Ike’s most likely destination in a trade. And while other candidates exist, Sandy Alderson has made it clear by his deeds that he’s just not going to give him away. The most likely scenario is the Mets and Davis are stuck with each other. Davis has not outwardly shown any discontent amid the flood of trade rumors that have surrounded him, and the Mets can only hope (once again) that Davis somehow puts it all together in 2014. They will at least hope he can be the Ike Davis of the second half of last year, when he slashed .286/.449/.505. He only hit four homers, but if he can at least not be the black hole in the lineup he was in the first half of 2012 and 2013, it will be a huge help to the Mets lineup. It may even behoove the Mets to sit him against tough lefties, since he only hit .145/.203/.203 against them last year. It was a small sample, but he clearly looked lost against southpaws. Behind Davis are Lucas Duda, Josh Satin, and perhaps Wilmer Flores, none of whom have proven themselves over a full season, but have all shown flashes of talent. These are the options the Mets have at first base going into camp. And one of them is going to have to step up and prove that the job belongs to him. Back Will Mets Pay To Keep Matt Harvey? Terry collins is only on a 2 year contract. Hopefully he will ‘ know’ his players better. Hopefully an understanding of a platoon role going into the season will benefit all concerned as opposed to terry continually putting players into positions where they will fail. Why would any team, in January trade a young guy, who is in their plans to be in the rotation, for a first baseman who fights to reach the Mendoza line, who is moody and injured or ill over half the time, who according to Janish, needs a team mate who will set a positive example for him, because the chance to make 15 mil if you play real good isn’t enough to incentivise him? Especially when this team is just like the team we ollow, a rebuilding, cheap organization! This is not July 31 where the Brewers think one guy gets them to the playoffs. This is just another example of the inept GM the Mets have. Um… you’re pointing out that Ike has no value, and then you still bash Alderson? What the heck could any GM get for a player who has no value? If the trade options are a few thousand bucks, a bucket of balls, or minor league filler, I’ll take my chances with Ike. Now if you want to blast Alderson for not moving Ike last offseason, I’d agree with that. Um, maybe I’m bashing Alsderson because he is a stubborn old man who thinks he id superior to every other GM in the game and makes assinine demands in a trade possibility. Maybe if he weren’t such a pompous a$$ he couldn’t have gotten something he needed likey a utility infielder, but no, he demands what he doesn’t. need. Um, maybe you should stop being in love with a guy who only produces losing seasons but saves the crooked owner a few bucks. Now we’re even. I’m glad we’re even! What are we even about? Me disagreeing with your baseball analysis, and then you claiming I’m in love with a guy I’ve spent the last 5 months mostly bashing? Do you think we could get a much better utility guy for Ike than we could get off the scrap heap? I kinda doubt it. With you, it seems that anyone who doesn’t share your unqualified hatred of Alderson is therefore in love with him. While I haven’t converted to a Sandy supporter, I take no issue with his deals for Wheeler, Syndergaard/d’Arnaud/Buck, and Black/Herrera. In each case, he got decent (and possibly superior) value for what he gave up. That he held his ground in not dealing Davis for peanuts is prudent; Davis may well find himself and become a productive player again. If that makes me in love with Alderson, that’s a pretty low bar. Izzy, I agree with your comments. But, what is wrong with the Mets trying to pry a good young arm for Ike? So no one bit. Ike has his flaws but a 1B that can put up 25 hr and play plus D is worth a $3.5 mil bet in this market. The SS and bullpen are more pressing needs. Ike will probably never hit lefties well but he should be able to improve on last season. Why are the Mets insisting on a pitching prospect? I thought the Met weakness was position players. I have no problem with the Mets holding out on Davis since he would not be blocking anyone from playing and the Mets are not going anywhere in 2014. I’d prefer they upgraded first but since they didn’t there is no reason to dump Davis. He can always go to the minors. Maybe he starts strong and someone gets desperate midseason. I think more trade partners are actually rich in pitchers with upside than in position players with a chance to be real difference-makes. Look at top prospect lists — the top 10 RH starters all throw 98 with okay control and a nasty #2 pitch, while the top 10 shortstops are a bunch of guys who may not be able to play the position and/or hit. The Mets are asking not for what they most need, but for what other teams may actually be willing to give up. Sadly for them, one team who’s not pitching-rich is the Brewers. I don’t mind the Mets asking for a pitching prospect but they seem to insist on it. If the Brewers didn’t have much pitching then why didn’t they ask about non-pitching prospects? Of course I am relying on what other blogs report. Agreed, if the Mets are being inflexible and turning down offers of position players, that’d be stupid. I haven’t heard of that happening, though. As for the Brewers, in addition to lacking pitching, I think they also lack expendable-yet-valuable hitters. They’ve got guys they need, and they’ve got junk, and not much in between. Or, well, that’s my guess based on ESPN comments.